American test pilot astronaut 1987-1995. Status: Inactive; Active 1987-1995. Born: 1951-03-24. Spaceflights: 2 . Total time in space: 13.65 days. Birth Place: Patuxent River, Maryland. Grew up in Virginia Beach, Virginia. Educated Annapolis; Patuxent. US Navy test pilot. PERSONAL DATA: Born March 24, 1951, in Patuxent River, Maryland, but considers Virginia Beach, Virginia, to be his hometown. Married to the former Maureen Ellen McHenry of Virginia Beach, Virginia. They have two grown children. Ken enjoys sailing, kayaking, and playing the guitar. His parents, Mr. & Mrs. Kenneth S. Reightler, Sr., reside in Virginia Beach. Maureen’s mother, Mrs. Jean W. McHenry, and father, Cdr. William H. McHenry, USN, are deceased. EDUCATION: Graduated from Bayside High School, Virginia Beach, Virginia, in 1969; received a bachelor of science degree in aerospace engineering from United States Naval Academy in 1973, and master of science degrees, in 1984, in aeronautical engineering from the United States Naval Postgraduate School and in systems management from University of Southern California. ORGANIZATIONS: Member, Society of Experimental Test Pilots (SETP); Lifetime Member, U.S. Naval Academy Alumni Association and the Association of Space Explorers; Associate Fellow, American Institute of Aeronautics and Astronautics (AIAA). SPECIAL HONORS: Defense Superior Service Medal; Legion of Merit; Defense Meritorious Service Medal; Navy Commendation Medal; Navy Unit Commendation; Meritorious Unit Commendation; Armed Forces Expeditionary Medal; National Defense Service Medal; NASA Exceptional Service Medal; two NASA Space Flight Medals; Space Station Program Office Program Manager’s Commendation; Johnson Space Center Certificate of Commendation; Numerous NASA Group Achievement Awards; INTELSAT EVA Recovery Team Award. Distinguished graduate, U.S. Naval Academy and U.S. Naval Test Pilot School. Absolute world altitude record for Class P aero-spacecraft. Mac Short Award in Aviation from U.S. Naval Academy (1973). Inducted into the Virginia Aviation Hall of Fame (1997). 1997 Technical Administrator of the Year; National Management Association’s “President’s Award”; Lockheed Martin COMET award for communications excellence. EXPERIENCE: Reightler graduated from the United States Naval Academy in 1973, and was designated a naval aviator in August 1974 at Corpus Christi, Texas. After replacement pilot training in the P-3C airplane, he reported to Patrol Squadron Sixteen in Jacksonville, Florida, serving as both a mission commander and patrol plane commander. He made deployments to Keflavik, Iceland, and to Sigonella, Sicily. Following jet transition training, Reightler attended the United States Naval Test Pilot School at Patuxent River, Maryland. Upon graduation in 1978, he remained at the Naval Air Test Center (NATC) where he served as test pilot and project officer for a variety of flight test programs involving the P-3, S-3, and T-39 airplanes. He later returned to the Test Pilot School, serving as a flight test instructor and safety officer flying the P-3, T-2, OV-1, T-39, and TA-7 airplanes. In June 1981 Reightler was assigned to the USS Dwight D. Eisenhower (CVN-69) as communications department head and carrier on-board delivery pilot, making two deployments to the Mediterranean Sea. Selected for postgraduate education, he attended the Naval Postgraduate School in Monterey, California. Redesignateded an aerospace engineering duty officer (AEDO) he was sent to transition training for the F/A-18 airplane with Strike Fighter Squadron 125 (VFA-125) at Naval Air Station Lemoore, California. He then reported for duty at the United States Naval Test Pilot School in March 1985, serving as the chief flight instructor until his selection for the astronaut program. He has logged over 5,000 hours flying time in over 60 different types of aircraft. NASA EXPERIENCE: Selected by NASA in June 1987, Reightler completed a year of astronaut candidate training and was designated an astronaut in August 1988. From September 12-18, 1991, he was the pilot on the crew of STS-48. This was the first Space Shuttle flight in support of "Mission to Planet Earth." During the five-day mission, the crew aboard the Space Shuttle Discovery successfully deployed the Upper Atmosphere Research Satellite (UARS), designed to provide scientists with their first complete data set on the upper atmosphere’s chemistry, winds and energy inputs. The crew also conducted numerous secondary experiments ranging from growing protein crystals, to studying how fluids and structures react in weightlessness. After 81 orbits of the Earth, STS-48 Discovery landed at Edwards Air Force Base, California. Reightler next served as pilot on STS-60, the first joint U.S./Russian Space Shuttle Mission. Launching from the Kennedy Space Center on February 3, 1994, STS-60 was the first flight of the Wake Shield Facility (WSF-1) and the second flight of the Space Habitation Module (Spacehab-2). During the eight-day flight, the crew of Discovery, including Russian cosmonaut Sergei Krikalev, conducted a wide variety of biological, materials science, earth observation, and life science experiments. Following 130 orbits of the Earth, STS-60 landed at Kennedy Space Center, Florida, on February 11, 1994. With the completion of his second mission, Reightler logged over 327 hours in space. 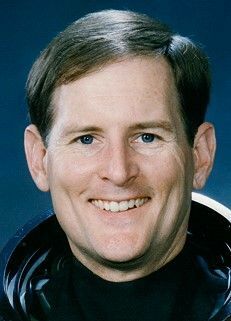 His technical assignments have included: Chief of the Astronaut Office Space Station Branch; Chief of the Astronaut Office Mission Support Branch; Lead Spacecraft Communicator (CAPCOM); Lead Astronaut for flight software development and computer systems; Flight Crew Operations Directorate representative to the Shuttle Program Requirements Control Board; Weather Coordinator for Space Shuttle launches and landings; Astronaut Office representative in the areas of ascent, entry, and aborts. In 1995, Reightler retired from the U.S. Navy with the rank of Captain (O-6) and joined Lockheed Martin in Houston Texas. He was responsible for managing engineering, science, communications, and mission operations programs providing technical services to NASA. In 1996 he was promoted to Vice President. In 2001 he was promoted to Senior Vice President, Lockheed Martin Space Operations (LMSO), responsible for the day-to-day operations of the company. In 2004 he was promoted to President, LMSO in Greenbelt, Maryland. Following the win of the Orion/Crew Exploration Vehicle contract in 2006, Reightler joined Lockheed Martin Space Systems Company as Vice President, NASA Program Integration. Born March 24, 1951, in Patuxent River, Maryland, but considers Virginia Beach, Virginia, to be his hometown. Married to the former Maureen Ellen McHenry of Virginia Beach, Virginia. They have two daughters. He enjoys sailing, wind surfing, camping. His parents, Mr. & Mrs. Kenneth S. Reightler, Sr., reside in Virginia Beach. Her mother, Mrs. Jean W. McHenry, resides in Virginia Beach. Her father, Cdr. William H. McHenry, USN, is deceased. Graduated from Bayside High School, Virginia Beach, Virginia, in 1969; received a bachelor of science degree in aerospace engineering from United States Naval Academy in 1973, and master of science degrees, in 1984, in aeronautical engineering from the United States Naval Postgraduate School and in systems management from University of Southern California. Member, Society of Experimental Test Pilots (SETP); U.S. Naval Academy Alumni Association; Association of Space Explorers; National Aeronautic Association. Defense Superior Service Medal; Defense Meritorious Service Medal; Navy Commendation Medal; Navy Unit Commendation; Meritorious Unit Commendation; Armed Forces Expeditionary Medal; National Defense Service Medal; NASA Exceptional Service Medal; two NASA Space Flight Medals; Johnson Space Center Certificate of Commendation; NASA Group Achievement Award; INTELSAT EVA Recovery Team Award. Distinguished graduate, U.S. Naval Academy and U.S. Naval Test Pilot School. Absolute world altitude record for Class P aero-spacecraft. Mac Short Award in Aviation from U.S. Naval Academy (1973). Family: Astronaut. Country: USA. Flights: STS-48, STS-60. Projects: STS. Agency: USN. Bibliography: 12, 5927. 1951 March 24 - . Birth of Kenneth Stanley Jr 'Ken' Reightler - . Nation: USA. Related Persons: Reightler. American test pilot astronaut 1987-1995. 2 spaceflights, 13.7 days in space. Flew to orbit on STS-48 (1991), STS-60..
1991 September 12 - . 23:11 GMT - . Launch Site: Cape Canaveral. Launch Complex: Cape Canaveral LC39A. Launch Platform: MLP3. LV Family: Shuttle. Launch Vehicle: Space Shuttle. STS-48 - . Call Sign: Discovery. Crew: Brown, Mark, Buchli, Creighton, Gemar, Reightler. Payload: Discovery F13 / UARS. Mass: 7,854 kg (17,315 lb). Nation: USA. Related Persons: Brown, Mark, Buchli, Creighton, Gemar, Reightler. Agency: NASA Houston. Program: STS. Class: Manned. Type: Manned spaceplane. Flight: STS-48. Spacecraft Bus: Shuttle. Spacecraft: Discovery. Duration: 5.35 days. Decay Date: 1991-09-19 . USAF Sat Cat: 21700 . COSPAR: 1991-063A. Apogee: 580 km (360 mi). Perigee: 575 km (357 mi). Inclination: 57.00 deg. Period: 96.20 min. Manned five crew. Deployed UARS; conducted materials and biological research. Payloads: Upper Atmosphere Research Satellite (UARS), Ascent Particle Monitor (APM)-03, Physiological and Anatomical Rodent Experiment (PARE)-01, Protein Crystal Growth (PCG)-ll-2, Middeck Zero-Gravity Dynamics, Experiment (MODE)-01, Investigations Into Polymer Membrane Processing (IPMP)-04, Cosmic Radiation Effects and Activation Monitor (CREAM-02), Radiation Monitoring Equipment (RME)-lll-06, Shuttle Activation Monitor (SAM)-03, Air Force Maui Optical Site (AMOS) Calibration Test. 1991 September 18 - . Landing of STS-48 - . Return Crew: Brown, Mark, Buchli, Creighton, Gemar, Reightler. Nation: USA. Related Persons: Brown, Mark, Buchli, Creighton, Gemar, Reightler. Program: STS. Flight: STS-48. STS-48 landed at 07:38 GMT. .
1994 February 3 - . 12:10 GMT - . Launch Site: Cape Canaveral. Launch Complex: Cape Canaveral LC39A. Launch Platform: MLP3. LV Family: Shuttle. Launch Vehicle: Space Shuttle. STS-60 - . Call Sign: Discovery. Crew: Bolden, Chang-Diaz, Davis, Krikalyov, Reightler, Sega. Backup Crew: Titov, Vladimir. Payload: Discovery F18 / GBA-6. Mass: 13,006 kg (28,673 lb). Nation: USA. Agency: NASA Houston. Program: STS. Class: Manned. Type: Manned spaceplane. Flight: STS-60. Spacecraft Bus: Shuttle. Spacecraft: Discovery. Duration: 8.30 days. Decay Date: 1994-02-28 . USAF Sat Cat: 22977 . COSPAR: 1994-006A. Apogee: 351 km (218 mi). Perigee: 348 km (216 mi). Inclination: 56.40 deg. Period: 91.50 min. Deployed ODERACS A-F, Bremsat, carried Wake Shield Facility. Payloads: Wake Shield Facility (WSF) 1 and SPACEHAB 02. Getaway special bridge assembly experiments: Capillary Pumped Loop (CAPL), Orbital Debris Radar Calibration Spheres (ODERACS), University of Bremen Satellite (BREMSAT), G-514, G-071, and G-536. Shuttle Amateur Radio Experiment (SAREX) II; Auroral Photography Experiment (APE-B). 1994 February 11 - . Landing of STS-60 - . Return Crew: Bolden, Chang-Diaz, Davis, Krikalyov, Reightler, Sega. Nation: USA. Related Persons: Bolden, Chang-Diaz, Davis, Krikalyov, Reightler, Sega. Flight: STS-60. STS-60 landed at 19:24 GMT. .